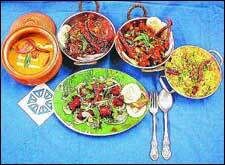 Chettinad Food Festival is an event that took place between 24-Feb-2006 and 05-Mar-2006 in Hyderabad. Where better to savour hot-n-spicy Chettinad than overlooking the placid, summer-green Hussain Sagar? The stink won't make its way in through the bullet-proof glass and the translucent calm of the large lake should cool-off the inevitable fire in  your mouth. Waterside Cafe has flown down Chef Yesudas from Rain Tree, Taj Connemara, Chennai to mix the special ingredients that go into authentic Chettinad. You can go for a pre-plated lunch from 1230 hrs to 1500 hrs or a buffet dinner from 1930 hrs to 2330 hrs. Gourmet tonguetwisting delicacies such as Appams, Thengal Kozhukottal, Kavanarisi Halwa  and Murunagai Keerai Saaru are on the menu and if that is getting your stomach gurgling uncontrollably, then make a headway to The Waterside Cafe before the 5th of March till when Chef Yesudas is sticking around to serve you the delectable cuisine. A vegetarian lunch meal comes for Rs. 375 + taxes, while non-veg is for Rs. 400 + taxes. Dinner is for Rs. 550 + taxes per head. Please contact 5566-9999 for further details. Be the first to comment on Chettinad Food Festival! Just use the simple form below. fullhyd.com has 700,000+ monthly visits. Tell Hyderabad what you feel about Chettinad Food Festival!